I finished up my last post right before bed last night, so didn’t notice a bunch of typos with it until I was in bed, browsing my news feeds (this blog’s among them) on my iPhone. (I use Reeder for this.) This presented an opportunity! Since all of my blog’s Markdown source files live in Dropbox, to which my phone has as much access as my laptop, surely there exists some app or other method to make quick edits through my phone? To the App Store! Where I quickly gave up, because browsing on the App Store is terrible. To Google (or a sensible alternative)! 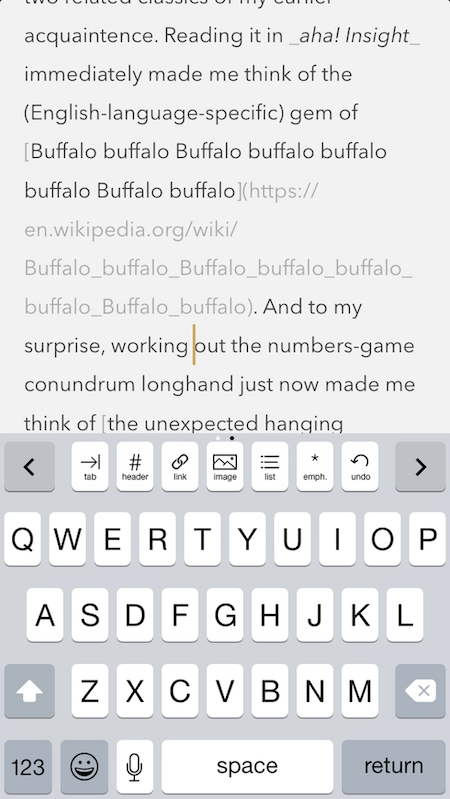 And here I followed a thread that led me to Byword, a Markdown-specific editor for iOS (with a Mac edition as well). I recall hearing plenty good about it, and its current App Store reviews suggest it hasn’t become terrible since then, so five minutes (and five dollars) later I found myself thumb-tapping away at my blog post with my head on my pillow, just as I’d hoped. This made me feel very happy. Not only did I clean up that post without having to roll back out of bed, but I unexpectedly found a powerful validation for one of Plerd’s core claimed strengths: that it lets a blogger use any text-editing setup they want to create and update their posts. So far my laptop has always served this role, but last night, with neither fuss nor planning, I for the first time tried to edit a post with a mobile device which itself knew nothing of Plerd — only of my Dropbox account. And it worked great! My only caveat with this particular setup involves how Byword apparently saves continuously, which from Plerd’s point of view means that the whole blog requires republishing with every keystroke. Practically speaking, this means that if one plans to make significant edits (or to create wholly new posts) via this setup, they should perform them outside of Plerd’s source folder, moving or copying the corrected files back in when it’s ready to share. Otherwise, the static HTML will display in-progress sentences to anyone happening to drop by the blog at that moment! But for little typos and such, editing the source file directly like I did last night works just dandily. One other current note about Plerd: I last week applied for a grant from The Perl Foundation to help me document, complete and release Plerd 1.0. The application remains open for public comment until Sunday, July 26. Please do have a look, if you wish!